The 2017 Maruti S-Cross’ mini brochure has leaked online, courtesy Team-BHP. The facelifted model is now available to booking online and at all NEXA dealerships across country. The 2017 Maruti S-Cross is available in Sigma, Delta, Zeta and Alpha grades. On the outside, the facelift brings LED projector headlamps with LED daytime running lights, a new chrome grille with vertical slats, 16-inch diamond cut alloy wheels and LED rear combination lamps. 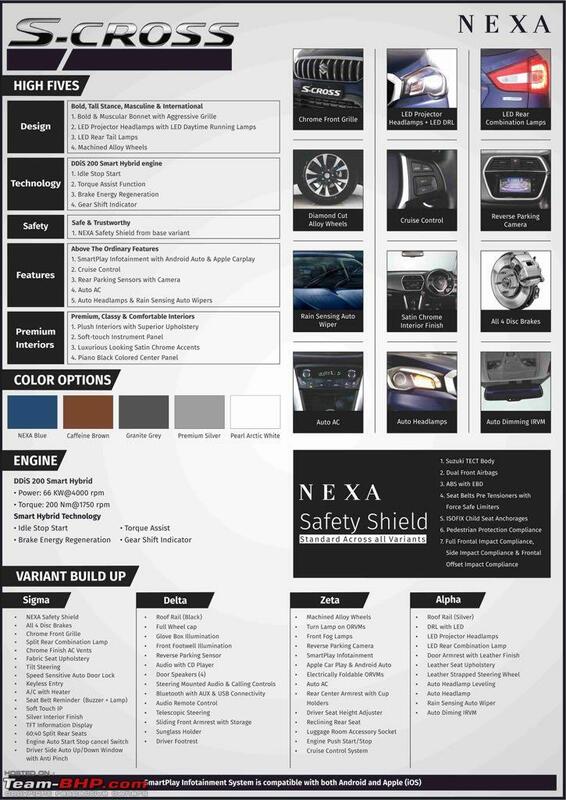 A new ‘Nexa Blue’ colour has replaced the Urban Blue colour. Inside, the Smartplay touchscreen infotainment system has Android Auto compatibility right from the get-go. The 2017 Maruti S-Cross is available in Sigma, Delta, Zeta and Alpha grades. The base grade has features like keyless entry, chrome finish AC vents, silver interior finish, all 4 disc brakes, ABS with EBD, dual-front airbags and ISOFIX child seat anchorages. The Delta grade adds black roof rails, full wheel caps, front footwell and glove box illumination, reverse parking sensors, audio player with Bluetooth connectivity and remote control, steering mounted audio & calling controls, sliding front armrest with storage and driver footrest. The Zeta grade features front fog lamps, 16-inch diamond cut alloy wheels, electrically folding ORVMs with integrated turn indicators, reverse parking camera, engine push start/stop, cruise control, automatic climate control, rear centre armrest with cup holders, height adjustable driver’s seat, reclining rear seats and Smartplay infotainment system with Apple CarPlay and Android Auto. The Alpha grade stands out with LED projector headlamps with LED DRLs, silver roof rails, LED rear combination lamps, leather seat upholstery, leather wrapped steering wheel and door armrest with leather finish. It has auto dimming interior mirror too. The 2017 Maruti S-Cross is available only with the 1.3-litre DDiS 200 diesel engine. With the mid-cycle refresh, the Maruti Suzuki has discontinued the 1.6-litre DDiS 320 diesel engine. The 1.3-litre DDiS 200 diesel engine producing 66 kW (88.47 hp) at 4,000 rpm and 200 Nm of torque at 1,750 rpm continues as before. The company has, however, made the crossover more efficient by employing Smart Hybrid (mild-hybrid) technology. The S-Cross now features engine auto stop-start, torque assist and brake energy regeneration. The new model has gearshift indicator too. The fuel economy has reportedly increased from 23.65 km/l to 25.1 km/l. 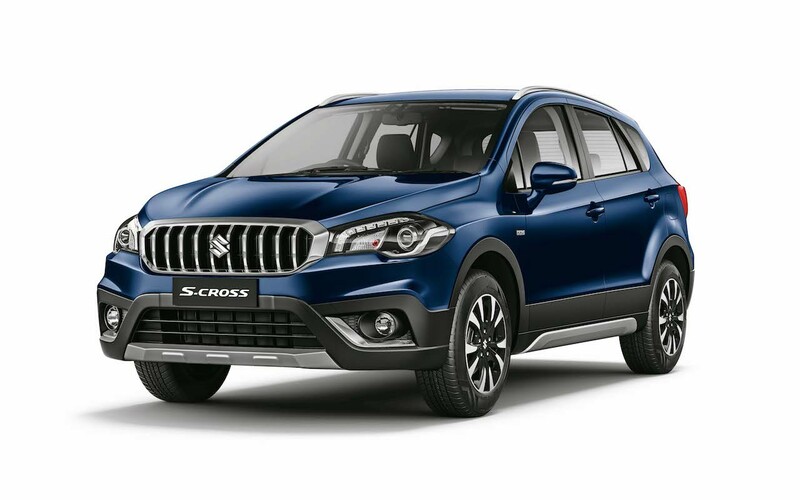 The 2017 Maruti S-Cross should go on sale in India in October, following its unveil tomorrow.